Not only does it hand other cars their butts, but it can handle the curves. And makes for a nice daily driver. Despite all the online comments, the Demon actually goes around turns. Better than a non-widebody Hellcat as well. What is a Demon? 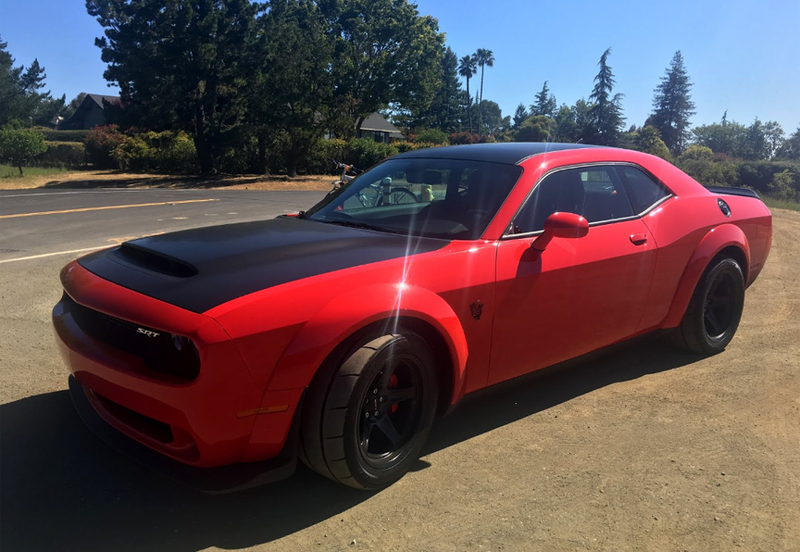 It’s an otherworldly Dodge Challenger Hellcat, possibly the world's quickest front engine, rear drive car, with a host of power increasing and drag strip use upgrades. Components are beefed up, power is increased with a larger supercharger, transmission has more aggressive ratios, it has wide body flares housing 315 width tires front and rear and a massive hood scoop. But the diabolism runs deeper than that including some production car firsts for drag strip use. A line lock is added to allow spinning the rear tires while the front brakes are activated to warm up the rears. A transbrake which holds first and second gear allows for engine power to be applied before the actual launch (think of a brake torque but in the transmission), in drag mode, the air conditioning is re-routed via an “after cooler” to reduce intake air temperature by up to 50 degrees. Cooler denser air enables more fuel for more horsepower. The Necromancy doesn’t end there. Besides some factory weight saving measures, including smaller brakes (don’t worry, you only need one emergency stop, not track duty), the interior only comes with a driver’s seat. But for $1 you can add a leather or in this case, cloth interior seats. There’s more wizardry for another $1 buys a Demon Crate that contains a replacement engine control module that has a tune to optimize race gas for more horsepower and torque, skinny front wheels without tires for lighter weight and less rolling resistance, as well tools to complete the summoning of the dark power. Interestingly it has 57 to 85 more horsepower than the brand new Corvette ZR1 with a similar engine size and roots type supercharger. 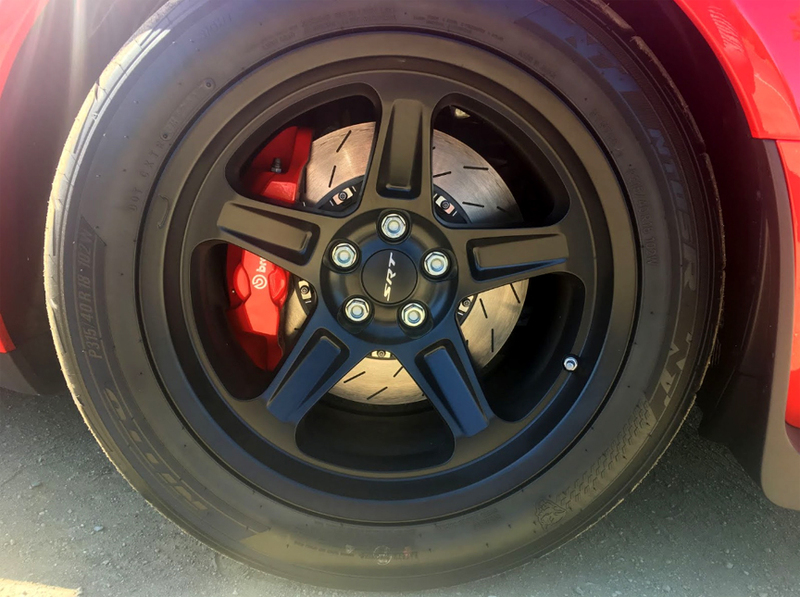 Having the good fortune of experiencing standard Hellcats and non-supercharged Challenger V8s at the Bondurant Racing School, the Demon’s wide body and non-drag mode suspension setting is not only a very comfortable street car, but pulls some appreciable lateral g’s in the turns, surpassing many sedans. On the street, the body roll isn’t bad and the speed around turns is more than sufficient to raise hackles. It reminded me of the standard suspension Mustang GT I recently evaluated. So why is the Demon and Hellcat judged on its handling when Bentleys, S-class coupes and other four (adult) passenger, two door coupes are not? The ride is perfectly comfortable as well. The other perception is it would be too loud. Nope, this frequently daily driven coupe is quiet at cruising and perfectly suitable for a cross country trip. It’s when the appropriately named loud pedal is brushed does it sound like a cruising muscle car with aftermarket mufflers and when all hell breaks loose, the supercharger whine also howls demonically. It’s as if the devil lost his minions. See the video for a launch example. This particular spawn from the darkest depths is no less practical than any other coupe and more than most since it fits four adults. Thanks to the drag radials with hardly any negative area, rain or snow basically forbidden. Surprisingly this one has been used for commuting to work, achieving 17mpg, which is impressive for suburban stop and go in an 808 horsepower, two-ton coupe. And much better than currently experiencing in the 707 horsepower Trackhawk. Acceleration is hellacious, I can’t help myself, and a linear, hard pull. A couple of non-drag mode launches from a standstill displayed brutal power and classic domestic soundtrack. It was a warm, dry day and only minor traction loss occurred with a slight wiggle while screaming on the highway to hell. The owner has extensive experience in high horsepower cars and has monitored Demon quarter mile results. He states it is as quick as his McLaren 675LT. The race tune, which requires unleaded 100 octane gas, adds 32 horsepower and 53lbs ft. of torque, adds a 3-4mph again in trap speed. The owner stated the difference isn’t perceptible. Interestingly, it is still emissions compliant. Having had a superb long term experience with a first generation SRT-8, the Bondurant Racing School loving their SRTs and Hellcats, this from Bob and his wife, the reliability should be a non-issue. This is also one of the most practical ten second quarter mile cars and at well under $100k, the least expensive and best sounding. A quick search on Autotrader shows several advertised at under MSRP. Shocking since the total production of 3,300 units ended recently. While further defending this hell child, straight line racing is the worlds most participated motorsport. 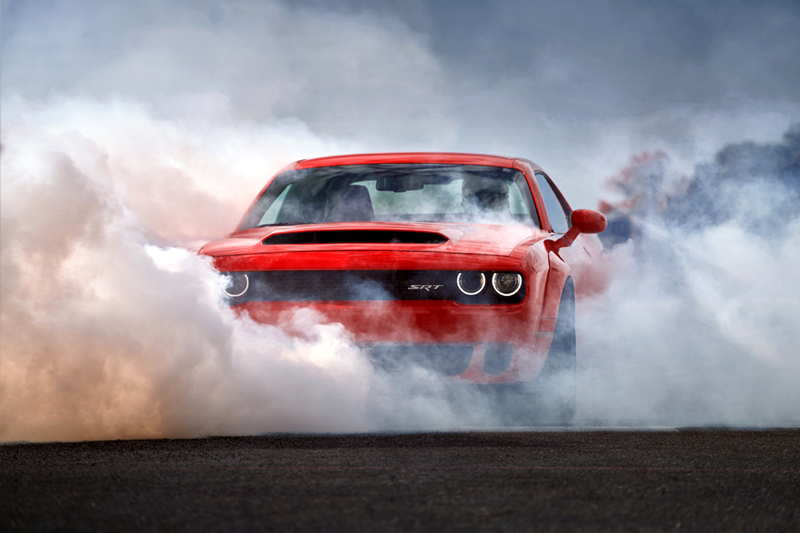 Manufacturers spend tens of thousands of dollars, if not more, trying to get the best possible lap time, why are they excused when Dodge went out to get the best possible timeslip for the Demon and published it, achieving 9.65 seconds at 140mph in optimal conditions with the full prep package - slicks in the rear, skinnys up front, race gas tune and just the driver’s seat. We all have our demons, but this one is practical, has no compromises and is hella fun to be in and drive.